ITALIAN RAILWAY - railmeds JimdoPage! The Italian railway system is one of the most important infrastructure in the country, with a total length of 24,227 km (15,054 mi). The network is recently growing with the construction of the new high speed railway lines. node lines (di nodo), which link complementary and fundamental lines near metropolitan areas for a total 936 km (582 mi). Most of the Italian network is electrified (11,921 km (7,407 mi)). Electric system is 3kV DC on conventional lines and 25kV AC on high-speed lines. 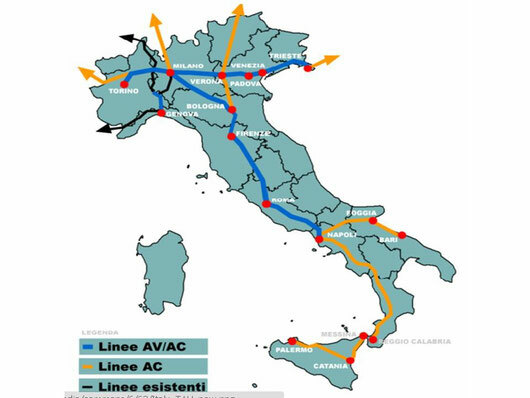 High Speed rail in Italy currently consists of two lines connecting all the country's major cities. The first line connects Milanilan to Salerno via Bologna, Florence, Rome and Naples, the second runs from Turin to Venice via Milan, and is under construction in parts. The network is designed for a top speed of over 300 km/h (190 mph). Service is provided by Trenitalia, although other companies, such as NTV, are going to compete on the same lines beginning in 2012. Several projects are underway to expand the network. Plans include both more domestic connections such as to Genova, and new international connections to France, Austria and Slovenia. ETR 450, ETR 460, ETR 485: tilting, speeds up to 250 km/h (160 mph) for other services, used as Eurostar Italia. New Pendolino ETR 610 are being introduced to the Italy-Switzerland route. TGV trains also run on the Paris-Turin-Milan service, and possibly between Paris and Rome in the future. The Milan to Salerno is the major north-south corridor of the high-speed network. The Milan - Bologna segment opened on 13 December 2008. Its construction cost was about 6.9 billion euro. The 182 km (113 mi) line runs parallel to the Autostrada del Sole, crossing seven provinces and 32 municipalities. There are eight connections with historic lines. At the Reggio Emilia interconnection a new station designed by the Valencian architect Santiago Calatrava is being built. Calatrava has also designed a signature bridge where the line crosses the A1 motorway. The line will travel through a new multi-level station at Bologna (Italy's principal railway junction) designed by Japanese architect Arata Isozaki, currently under construction. The Bologna - Florence segment opened on 12 December 2009, allowing a 37-minute journey between the two cities. The Bologna-Florence high-speed section was particularly complex to build mainly because about 93% of its 78.5 km (48.8 mi) runs through tunnels under the Apennines range. The line has a nine tunnels, from 600 meters to 18.5 km (11.5 mi) long, separated by short surface stretches (less than 5 km in total). Florence will have a major new multi-level high speed station at Belfiore designed by British architect Norman Foster. The Florence- Rome segment consists of the older "Direttissima" (literally: most direct) line between the two cities, with a length of 240 km (150 mi). The first high-speed line in Europe, the "Direttissima" was completed in between 1977 and 1986. This segment is currently being upgraded by High Speed Train. Entering Rome, high-speed trains have the option of stopping at either the new intermodal station at Tiburtina, developed by architects ABD Associate led by Paolo Desideri, or Termini Station. The Turin to Novara segment of the Turin to Trieste Corridor runs for 85 km and opened in February 2006. TheNovara to Milan segment opened on 12 December 2009, allowing a 59-minute journey between Milan Centrale and Turin Porta Nuova (45 minutes from Milan Porta Garibaldi to Turin Porta Susa). The two segments combine for total of 125 km, 80% (98 km) of which are in the region of Piemonte (provinces of Turin, Vercelli and Novara) and 20% (27 km) in the region of Lombardy (province of Milan). To minimize its impact on the area, theTurin to Milan segments run inside the existing infrastructure corridor, next to the A4 Turin-Milan motorway. The Milan to Venice segment includes stretches from Padova to Mestre (for Venice) and Milan to Treviglio now in service. Priority sections of track are under construction: the approval procedures for the Treviglio to Brescia tracks will begin shortly. Trenitalia is the primary train operator in Italy. Trenitalia is owned by Ferrovie dello Stato, itself owned by the Italian Government.